London-based fashion and social documentary photographer, Iain McKell, is notable for his arresting and unconventional images of high-fashion and youth subculture. For his recent project, The New Gypsies, McKell spent over ten years tracking and living with a small group of present-day nomads. Seeking an alternative to western capitalist society, the New Gypsies are rural anarchists. 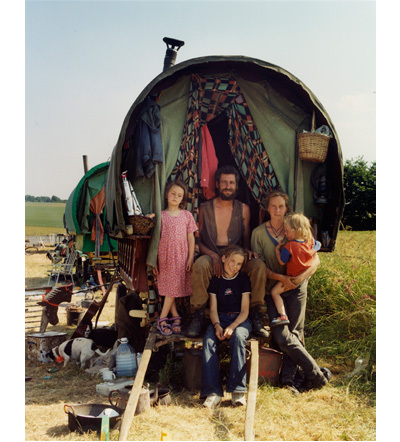 Evolving from the New Age Travellers – a group of post-punk anti-Thatcher protestors living in buses in England in the mid-80’s – the New Gypsies roam the English countryside in elaborately-decorated horse-drawn caravans, free from the reigns of urban society. Unaffiliated with the infamous ROMA gypsies residing in Central and Eastern Europe, they share no ethnographic core. Simultaneously romantic and practical, theatrical and natural, wistful and raw, McKell’s breathtaking photographs offer a first glimpse into this beautiful and subversive community. In conjunction with his current exhibit at the Clic Gallery in New York, McKell spoke with PLANET° about the origins of the project, the New Gypsies unique sense of style and visions of the future. 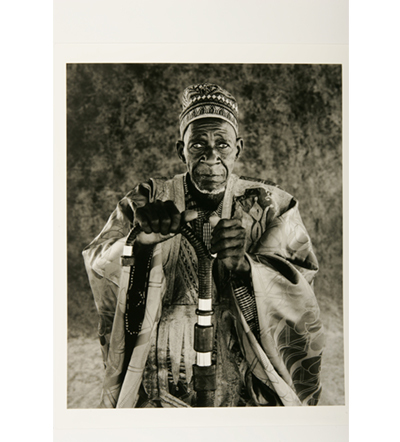 Nabaas—Traditional Chiefs of Burkina Faso is on view at the Bekris Gallery, San Francisco through December 29. American comedy writer/director Tom Schiller is known for his distinct style and offbeat humor. Notable for his eleven-year stint writing and directing short films on Saturday Night Live, Schiller’s impressive oeuvre of work also includes the 1984 unreleased classic feature, Nothing Lasts Forever, and over 300 comedic TV commercials. Schiller may not be as prominent as his SNL cohorts Lorne Michaels or Bill Murray but he has certainly been as pivotal in shaping the landscape of comedy. With the recent revival of Nothing Lasts Forever, Schiller has achieved a cult status. 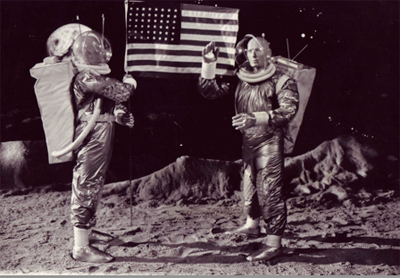 In preparation for his upcoming screening at The Cinefamily in Los Angeles, Schiller spoke with PLANET° about growing up on the set of I Love Lucy, why Nothing Lasts Forever was never released, and how Fellini got him out of a ticket. Your father was a staff writer on I Love Lucy. Did that have any influence on your interest in comedy? Yes, well I had it by osmosis…you know what I mean? You can’t say it about yourself, but others told me I was funny. My filmmaking techniques would have translated fine into comedy. I was able to do it. And also, growing up being on the set of I Love Lucy, I certainly learned a few things from that…. 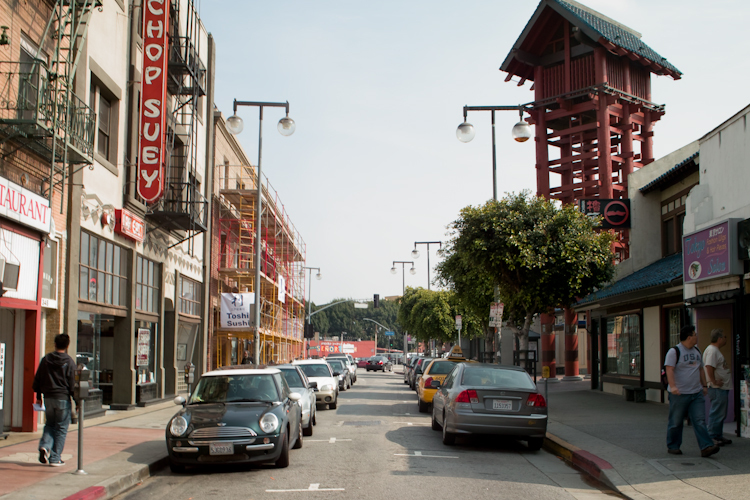 Los Angeles-based designer/writer David Yoon transforms LA’s overwhelmingly expansive thoroughfares into more digestible streets in his blog, Narrow Streets: Los Angeles. The project — “a fantasy urban makeover” — began one Fourth of July weekend when Yoon was strolling along Montana Avenue and was struck by the sheer emptiness on the otherwise bustling five-lane road. Inspired by the narrow corridors of old Europe, Yoon took carefully framed photos of the street then went home and narrowed it down to a single lane in Photoshop. The result was “irresistible in its suddenly human scale” and the start of Narrow Streets: Los Angeles. Designed to provoke the viewer’s imagination, Narrow Streets emphasizes the importance of street design in dictating car speed, traffic, and ultimately our perception of urban environments. Through narrowing L.A.’s oversized streets, Yoon hopes “to re-calibrate people’s standard of space”, and in doing so “provoke people into re-examining their urban environments in a way that is immediately visual and visceral”. While Yoon considers Narrow Streets to be more fanciful than practical concept art, “the project has definitely struck a chord with people who are hungry for a city that’s less car-focused, less about being a place to plan getaways, and more about enjoying life on an everyday basis”. Narrow Streets may just be a pipe dream for Los Angeles, but it’s certainly redefining the way we view our vast city of asphalt. 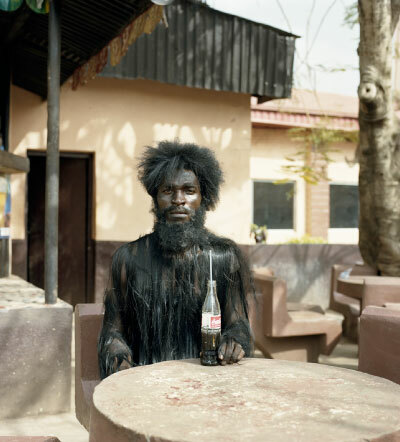 South African photographer Pieter Hugo is known for his arresting and unsettling portraits of African life. For his latest series, Nollywood, he interpolates the burgeoning industry of Nigerian cinema into everyday scenarios to construct fictional surreal situations. Three weeks since the earthquake devastated Port-au-Prince, Haiti, the suffering continues. 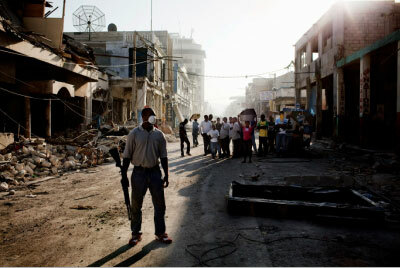 French photojournalist Frédéric Sautereau spent a week in Port-au-Prince documenting the situation. Internationally recognized for his work dealing with the dual notions of border and divide, Sautereau has reported on places in turmoil – political, economic, or otherwise – including Kosovo, Gaza, Burma, North-Kivu, Hurricane Katrina, and 9/11. Shortly after returning from Haiti, PLANET° was fortunate enough to speak with Sautereau about his poignant photographs and just how far Haiti is from a full recovery. As with our previous coverage of the Haiti Earthquake, we urge you to donate to Oxfam or Doctors Without Borders. Please bear in mind that with Red Cross, ninety cents of every dollar goes to administrative expenses and only ten cents reach the people. How do you view your role as a photojournalist in the wake of the disaster in Haiti? I am a journalist, so my role is to present the images I see, what I perceive and understand from the situation. As for what’s happened in Haiti, it means trying my best to convey the situation of distress and chaos, which now rules in this region, and also for the purpose of representing the deaths. I try to do this with intellectual honesty. Allison Schulnik paints rejects. For her second solo exhibit at the Mark Moore Gallery, aptly titled Home for Hobo, the Los Angeles based artist focuses on one of her recurring subjects — the hobo clown — to extend her family of outcasts to include possums, raccoons, and Klaus Kinski. 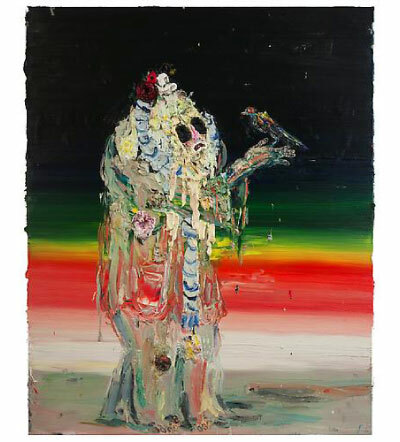 Comprising ten paintings, four sculptures, and a four-minute claymation music video for Grizzly Bear, all dated 2009, Schulnik’s new work embodies the same macabre sensibilities of her previous works, utilizing kitsch subject matter in the traditional formats of portraiture, landscape, and still life. Refreshingly honest, Schulnik’s work is that of excess. Caked in thickly applied impasto, her fantastical characters appear to be melting off the canvas, residing somewhere between their world and ours. Schulnik remarks, “It just felt right for the characters that they should not be so together. They’re falling off of their skeleton, they’re falling off of their own frame.” Simultaneously stunning and unsettling, the characters stare longingly for something that only exists within their fictional frames — beauty, love, refuge, recognition. Growing up in San Diego, Schulnik describes her childhood as unstructured. “I went around town making art and being bad and being good.” Trained in different forms of dance, Schulnik left the art of moving for the art of the moving picture. Attending the California Institute of the Arts, Schulnik received her BFA in Experimental Animation in 2000. After graduating, Schulnik worked in studio animation for about six years before transitioning entirely to her solo work. A lover of all the archaic forms of art making, Schulnik is a purist at heart. Halfway between the U.S. and Japan lies an island of albatross that have unintentionally become plastic consumers. Lighters, small toys, golf balls, toothbrushes, and bottle caps imported from the nearby Pacific Garbage Patch are among the birds’ staples. Rupturing this surreal symbioses are Chris Jordan’s Midway photographs. 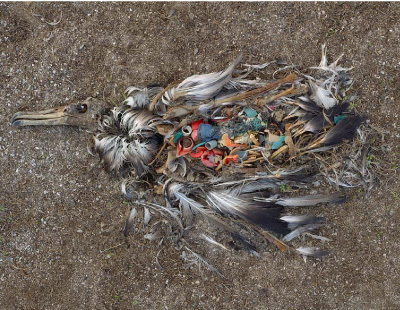 Taken only weeks ago, the images depict decaying carcasses of albatross chicks gorged with plastic. Intolerably beautiful (a phrase taken from another project of Jordan’s depicting our collective environmental impact), the photographs are visible consequences of our everyday lives. 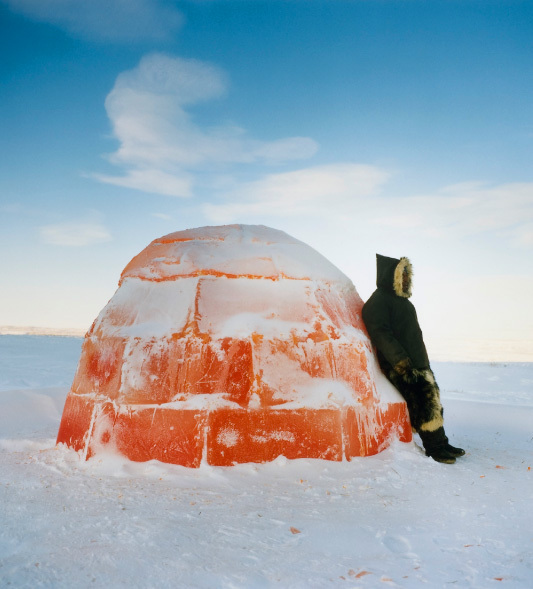 With over half of the population under the age of 16, most of the youth know nothing of the traditional ways of Inuit life and are completely Westernized — “going to school, learning how to use the computer, consuming Western food and drinks like soda and juices.” Addressing this disconnect is “Lemonade Igloo”. For it, Graafland fashioned lemonade ice blocks out of water and lemonade powder, and then had the elderly Inuit men use the blocks to build an igloo. When it was all finished, Graafland invited the Inuit children inside to drink orange juice. Other works illustrate the vastly differing seasonal weather conditions characteristic of arctic environments, as well as the devastating effects of climate change. For those looking for an eco-friendly way to get around the city, without actually having to exert extra energy en route, there’s P.U.M.A. 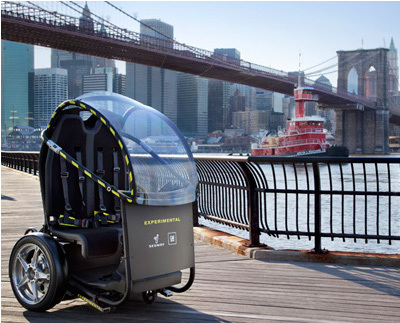 Designed by Segway — the company who developed the Segway— and General Motors, P.U.M.A., which stands for Personal Urban Mobility & Accessibility, may just be the solution for eco-conscious urbanites everywhere. Like the Segway, the P.U.M.A. features advanced sensing and dynamic stabilization with a zero turning radius. Unlike its older brother, it includes a domed weatherproof roof and seating for two. Suitable for both city roads and bike lanes, the P.U.M.A. can travel between 25 and 35 mph for twenty-five to thirty-five miles on a single battery charge — which take five to eight hours — making it an ideal vehicle for short commutes. Costing, approximately sixty cents in electricity per charge, and estimated to cost less than most current small cars, the P.U.M.A. is also highly cost-effective. With only one prototype in existence, and no plans to start selling the P.U.M.A. anytime soon, our hopes of owning the perfect clean transportation vehicle will just have to wait. In the meantime, you could always get a bike. We still think those are awesome.